I’ve officially renamed this race Tour de La Nino` for all the rain. How can 30% Saturday and 20% Sunday turn into 200% all weekend? I don’t know either but it did. We drove through a few showers heading to the race- nothing to cry about. Right when we got to the RR I told Kevin we better put up the shelter – just in case. Sure enough – it was raining just before the race, and I hate rain before the race starts. Race attendees included the race regulars – you know who you are. We started off our 65 mile race in what seemed to be a full day of pouring rain – even when it slacked off – you couldn’t really draft off of anyone because of the rooster tails flying in your eyes. This year included a few racers from the Austin area – which made the race much more difficult and dynamic. I remember a couple of attacks – then reeling them in slowly then all of a sudden Kevin was on a break-away with Don for about 15 miles. The Austin and Mid-south guys did a lot of work to reel them back in. After the first lap was the hot spot and because it was the first lap – you are not exactly sure where the finish line is. An Austin rider went at about 400 meters to go and I don’t know why – but I jumped early with him, and when he let up I was looking at 275 meters to go – I didn’t even finish out the sprint. The 2nd lap was a bit more interesting, I actually got away with one of the Austin guys and we had a 200 meter gap at one point – next thing you know, he says he has a flat. He pulls over and I nail it – but got tired quick all by myself – so I decided to wait on the pack after 3 miles of pain. I actually started to cramp a bit, so this was in the back of my mind as well. With 2 miles left to go, Kevin and a Austin rider get a gap and were working together. Next thing you know Kevin is all by himself – because the other guy flatted. So – he was kind of in no man’s land and decided to keep pushing. Back in the pack, there were 3 riders pulling off the front and I allowed a gap and they eventually bridged to Kevin and they all finished about 30 seconds ahead of us. This was a really hard RR – with the presence of Bike Barn and others from Austin really kept the pressure on. I got back to the truck only to find a collapsed tent from all of the rain. 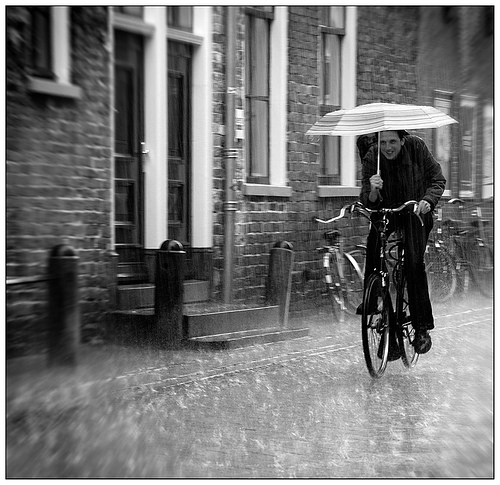 While warming up on the rollers for the time trial – I feel big drops – then rain again. I couldn’t believe this crap. If that didn’t top all, my zipp 808 rear tubular flats on the rollers – impossible. I hurry up and threw my 32 spoke training wheel on and headed to the line – realizing afterwards that I only had about 75 pounds in it due to the RR rain. So – I was mentally screwed before this event. I ended up in 8th place for the TT. Time for criterium – Kevin and I decided we were going to gamble the whole race – but the rain was so bad – the crit was cancelled. The women’s race was going on when we drove up, and they were having to small ring it into the wind and rain it was so bad. The race was called at this point and I wasn’t too disappointed that they cancelled the crit. I wasn’t really looking forward to it. Tour de La – officially in the books.